The first feature-length documentary devoted to African-American speech, “Talking Black in America: The Story of African American Language,” made its Pittsburgh debut last week. Nearly 150 people from the Carnegie Mellon University and local communities attended the screening and a panel discussion featuring Waverly Duck, associate professor of sociology at the University of Pittsburgh and visiting associate professor in CMU’s Center for African American Urban Studies & the Economy (CAUSE); Lovie Jewell Jackson Foster, prevention specialist at Allegheny County Children Youth and Families; and Tamara Sanders-Woods, principal of Pittsburgh Public Schools’ Colfax Elementary and Middle School. Walt Wolfram, executive producer and the William C. Friday Distinguished University Professor at North Carolina State University, introduced the film and participated in the discussion. “Talking Black in America” came to Pittsburgh thanks to English Professor Barbara Johnstone. The film explores African-American ways of talking from Harlem, Charleston, Atlanta, Chicago, Detroit, rural Mississippi, the Bahamas and more. It features supporting commentary from linguists, historians and other experts, and unpacks persistent controversies surrounding African-American language — such as the controversy about the Oakland Unified School Board’s decision to recognize African American Vernacular English in their curriculum in the late 90s. 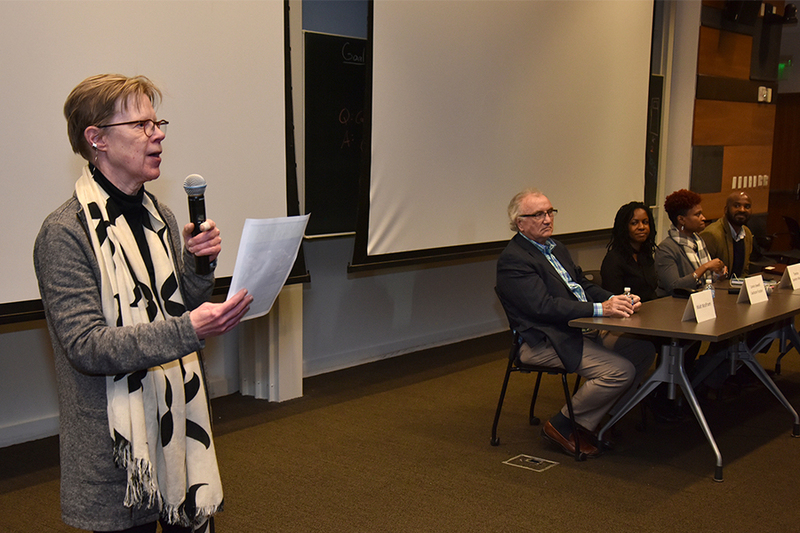 Both events were sponsored by Carnegie Mellon’s Department of English and Language Technologies Institute and the University of Pittsburgh’s School of Education, Center for Urban Education and Department of Linguistics. The Pittsburgh Community Broadcasting Group (WESA/WYEP) was the media sponsor.